Australia is the worlds largest island and smallest continent of an area of 7,686,850 sq km, with a coastline of 25,760 km, and in 1946 it had approximately 7 million people, or less than 1 person every sq km. Australia is an area slightly smaller than the 48 mainland states of the United States of America, and consists of 6 self governing states and two Federal territories. Much of the land mass is desert or waterless plains with 65% of the population living on the coastal fringes. Many prefer to live in country towns, and on large and/or isolated farms. These rural communities could be hundreds of miles/kilometers apart, and in the tropical wet season, be isolated for weeks on end. The beginnings were small, and mainly confined to Melbourne to Sydney and Brisbane, and Perth before January 1947, as aircrews, cabin staff and ground handling facilities were being developed, but within four short years TAA would set yet another 'first' in Australia's aviation history. Increasing numbers of aircraft, flight crews and other essential staff and facilities were rapidly established, and remembering that you really only needed a waiting lounge at the airport, a city terminal with airline coach service, and reliable 'on time' aircraft departures, and that air travel was expensive, this was the scenario for the first class traveler of this era. The biggest route development happened in 1949, when TAA took over the major routes operated by Guinea Airways from Adelaide to Darwin. QANTAS returned its entire Queensland operation to be included in the domestic network, while it pursued it international ambitions. 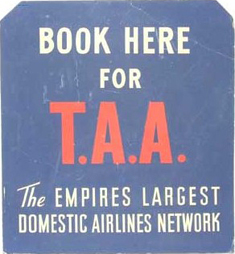 Charged with a task of establishing a national network while providing competition for the existing national carrier servicing the major cities, TAA management had a daunting task and innumerable challenges, manned by 'raw' recruits and a lack of experience, except for a few senior management personal. This merely provided the incentive to succeed and eventually establish what would become the biggest airline network in the British Empire, later to become the British Commonwealth of Nations. The start was to link the two major cities of Melbourne and Sydney, and establish competition for ANA who was already servicing this route. Then to link the third largest city , Brisbane with Sydney and Melbourne, then Adelaide, Perth and Tasmania, whilst continuing the expand northwards to Townsville and Cairns via intermediate stops.